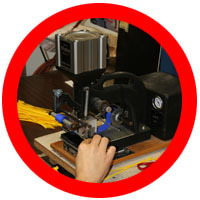 Hot stamping is one of the most cost effective, permanent ways to identify your wires and cables. Cable Markers Company has been hot stamping since we bought our first machine in 1977. Over 30 years later, we've perfected the process which involves a delicate balance of heat, presure and foil. Our hot stamping expert (Dan Huniu) has been putting his mark on the world's cables since he began here in 1984. Hot stamping allows for marking on a large variety of Tubings, Sleevings, Identification Markers Plates, ID Cable Ties, plastic components, and just about anything else with a flat surface. If we can't hot stamp on it, it can't be done! 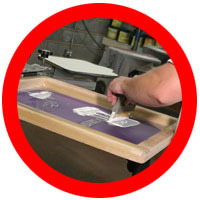 Thermal transfer printing is a process that uses a thermal print-head to apply heat to the surface being marked. Used in conjunction with a heated ribbon, thermal transfer printing produces durable, long lasting, text and images on a wide variety of materials. This allows us to print on many of our identification products including, heat shrink tubing, sleeving, continuous vinyl, ShrinkTrak markers, our line of thermal transfer printable labels and much more. We use our Windows driven Sumimark, and Tagprint Pro 2.0 label creation software to produce today's most advanced labeling solutions. 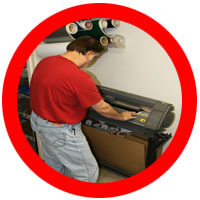 Having these computerized systems, in house, allows us to quickly, accurately produce labels and markers to your company's detailed specifications. Our printed heat shrink markers meet Mil-Spec standards MIL-M-81531 and SAEAS81531. Depending on the job, Cable Markers Company can ship custom printed orders the same day! Do you need your heat shrink tubing and sleeving supplied to you in pre-cut lengths? Well, look no further! Cable Markers Company has been providing our customers with bulk cut tubing and sleeving since we purchased our first cutting machine over 30 years ago. Since then, we've upgraded our cutting capabilities with today's most advanced tubing and sleeving cutting machines. This allows us to quickly, easily and accurately supply you with pre-cut pieces when you need them. Save time and money by ordering your bulk cutting requirements from us today! 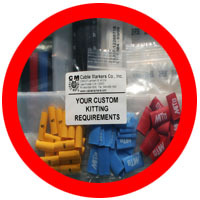 Sometimes a job requirement calls out for a variety of wire and cable identification products offered at cablemarkers.com. When requested, we can provide pre-packaged kits that are ready for in-house or job site use. Don't waste time sorting your labels, markers, id plates, and wire management products when we can do it for you. Save time and money by having Cable Markers Company supply you with the products you need in packaging that you can easily and efficiently use. Call one of our experts today with your specific kitting and packaging needs. 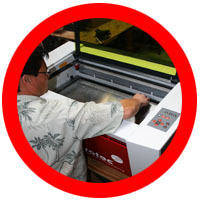 We offer the latest, state of the art, laser engraving, marking and etching services. Our fiber laser enables us to engrave on difficult to mark materials with detailed results as well as a wide variety of metal, plastics, industrial & medical components. We offer custom vinyl cut lettering and logos with the finest quality vinyls available for indoor and outdoor applications. We can cut letters and logos from your supplied electronic files in a wide variety of colors and sizes.